Major Gerald F. Pirie was born in North Oxford at Lot 1 Concession 5. He attended Banner school and Ingersoll Collegiate Institute, St. Andrews College Aurora and Ontario Agriculture College, Guelph. He was employed with Swift Canadian Company at the time of enlisting as a private in the Canadian Army, at 12 B.T.C., London. After attending Officer Training Centre in Three Rivers, Quebec and Gordon Head B.C. he graduated as a lieutenant. Gerald took part in the Normandy Campaign with the Queens Cameron Highlanders as part of the 2nd Canadian Division. He saw action through France, Belgium and Holland. Gerald was promoted to captain while serving in the field. 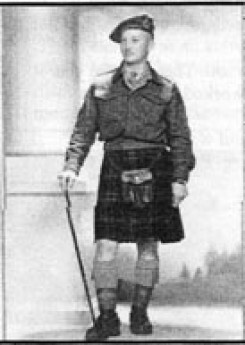 He was associated with the Oxford Rifles Militia and later became garrison commandeer of the 3rd Battalion of the Royal Canadian Regiment. He returned to Canada and civilian life in 1945. In 1947 he purchased the family farm and resided there until he retired to Ingersoll in 1971. Gerald died May 29, 1984.